Keep yourself reliably dry and protected from the elements with the Coleman 20mm PVC Rain Suit. 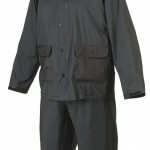 Constructed of durable, waterproof 20mm PVC, the Rain Suit includes a rain jacket and pants. The jacket features a stow-away drawstring-adjustable hood, snap-adjustable cuffs, and a storm flap over the center front zipper — all to keep you dry and the moisture out. There are 2 lower pockets for convenience. The pants have an elasticized waist and snap-adjustable leg openings for a good fit. The Rain Suit stores compactly in the included carry bag. Two-piece, 100 percent waterproof rain suit will keep you dry and comfortable in the wettest weather. 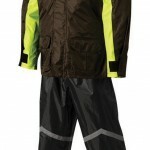 Soft polyester outer shell with PVC backing and reflective striping on both jacket and pants for night visibility. 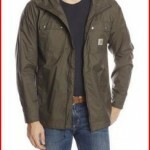 Jacket has full-length zipper with Velcro storm flap and a soft corduroy inner collar with hood. Two large outer pockets, cooling vents under each arm, elasticized waist, and adjustable cuff with Velcro tabs. Pants feature elasticized waist band, cuffs, oversized zipper gussets and elasticized boot stirrups. 2 year ‘no hassle’ warranty. Keep yourself reliably dry and protected from the elements with the Coleman 30mm Industrial Rain Suit. 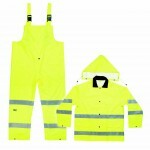 Constructed of durable, waterproof 30mm PVC-coated polyester, the Rain Suit includes a rain jacket and bib overalls. The jacket features a corduroy collar to keep your neck dry; draw the drawstring hood around your face for protection, wear it loose, or remove it altogether. Snap-adjustable cuffs and a front zipper with storm flap make sure you stay dry and the rain stays out. The bib overalls have adjustable suspender straps, a snap-fly front, snap-adjustable leg openings and reinforced knees. The Rain Suit stores compactly in the included carry bag. 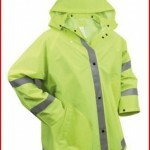 Heavyweight rain jacket with polyester/pvc material and reflective striping on front, back and sleeves. 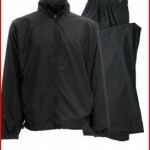 Other features include: Snap up front and cuffs, snap on hood with drawstring and 2 front slash pockets. Product Description From the Manufacturer Our new CLC Signature line pushes pride in workmanship to new heights. Our Signature Nail and Tool Bags, Combo Aprons, and Suspension Combos represent the sum total of everything we’ve learned about crafting the finest top grain cowhide and ballistic nylon into the most functionally luxurious products available. CLC Signature products are soft to the touch and rugged to the core. With gusset stitched pockets for better access and more capacity. Stress points are riveted with top and bottom plated steel washers. When the elements are working against you, we have the gear to help keep you dry. 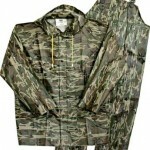 Our rain suits, boots and ponchos are designed and built to stand up to the most severe we weather conditions. So, when Mother Nature throws you a curve, be prepared with quality CLC Climate Gear rainwear. Lifestyle Apparel: Rainwear.-Rainwear: Complete suits.-Under arm vents and raglan sleeves with take up snaps at cuff for comfort.-Vented cape back for comfort.-PVC 3-Piece.-Storm fly front with snaps.-Jacket with detachable hood and drawstring.-Bib overall with storm fly front.-Adjustable buckles and strap with elastic insert.-Made in the USA. 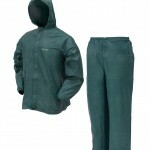 Suit includes both the jacket and coordinating pants, which are waterproof, wind resistant, and breathable. Made of 100% quiet polyester with a mesh lining in the jacket for added comfort. Jacket features two front pockets, elasticized cuffs, and barrel closure waist for added protection from the elements. Pants feature elastic waist with snap closure, front fly zipper, as well as 10″ zippered cuffs for easy on and off over golf shoes. Compacts nicely to a 12″ X 10″ zippered pouch on back of jacket for easy storage. The iXSPA Men’s Packable Golf Rain Suit is both waterproof and wind resistant, to assure you stay dry and comfortable throughout your round. 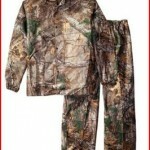 This packable suit consists of both jacket & pants and is made from 100% quiet polyester. Stay dry with a packable rain suit from iXSPA! 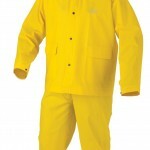 Waterproof, wind-resistant, and breathable rainsuit includes both jacket and coordinating pants. Jacket features a mesh lining, two front pockets, elasticized cuffs, and barrel closure waist for added protection from the elements.